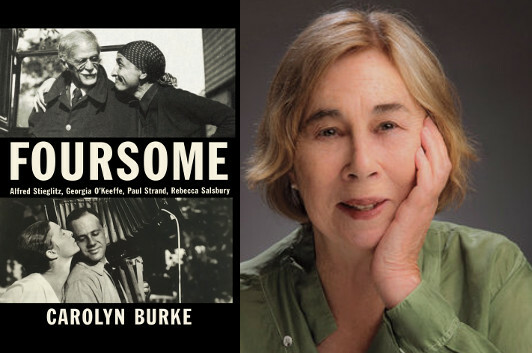 I first met Carolyn Burke in 1995, when we discussed her biography of the early 20th-century artist Mina Loy. A decade later, Burke and Hazel Rowley shared some of their correspondence about literary biography with me. I’m delighted to introduce you to her latest book, Foursome, a group history exploring the interlocking lives of the photographers Alfred Stieglitz and Paul Strand and the painters Georgia O’Keefe and Rebecca Salsbury James. Over a span of decades, their personal and artistic passions frequently overlapped one another, until each of them owed something of their development to the other three. Sorting that story out wasn’t easy, but, as Burke writes in this guest essay, it was an opportunity that came along at the perfect moment. Writing my way to the end of No Regrets, I seemed to be lingering, in my imagination, at Edith Piaf’s grave—where I first felt the sense of communion with the chanteuse that prompted me to write about her. I enjoyed writing that book so much that I could not imagine devoting myself to another birth-to-death biography. What I did not realize until later was that in bidding adieu to PIaf, I was sensing the need for a break from the linear model of life-writing. In retrospect, it seems that writing lives of Mina Loy, Lee Miller, and Piaf has pointed the way to the idea of a group portrait, the kind of book that emboldened me to embrace the role of story-teller. When I was wondering what to do next, an artist friend told me about a little-known ‘modern woman’ named Rebecca Salsbury James— “your kind of subject,” he said. She was just that, I learned from the scant material I could find about her. Still, Rebecca’s perspective on her years with the group of creative spirits around the photographer and cultural impresario Alfred Stieglitz—as the wife of his protégé, Paul Strand, as the close friend of Georgia O’Keeffe (who would marry Stieglitz), and as Stieglitz’s muse and correspondent—allowed me to imagine a narrative that interwove the lives of its protagonists, a tapestry, or, as I would come to see later on, the Southwestern embroidery called colcha adapted by Rebecca once she moved to Taos. At first I studied biographies whose authors had attempted something similar: James R. Mellow’s Charmed Circle: Gertrude Stein & Company, David Hajdu’s Positively 4th Street, and Sherill Tippins’ February House, about W.H. Auden, Carson McCullers, Jane and Paul Bowles, Benjamin Britten, and Gypsy Rose Lee. But each was unique to its subjects, ungeneralizable. The idea of Foursome began to take shape as I read through Rebecca’s letters, in which the person she was becoming under Stieglitz’s tutelage seeks to understand her role in the shaping of their foursome. Amplified by the correspondence in their respective archives, the narrative would trace their relations over several decades. At first I hoped to devise a structure that would invite the reader into the unfolding of their lives together, not a retrospective look back from our perspective but a way to let us feel some of what they felt as their lives progressed. I soon gave up the idea of any external structure and let myself be guided by discoveries made in the course of reading their correspondence and pondering their implications for the shape of twentieth-century American art. Before long my protagonists started telling me how to recount their stories. Still mulling over the idea of a narrative with several threads, I concentrated on the years when relationships among them were at their most intense. After the introduction of its dramatic personae, Foursome relates the entanglements of their lives in the 1920s and 30s, when sexual and professional imbroglios kept bringing them together and tearing them apart. While writing the book, I came to believe that my characters’ search to conciliate the often contradictory pulls of personal and artistic life still speaks to us a century later. I also came to understand the pleasures of collaboration. Foursome would not have been written without the participation of Lance Sprague, the artist who introduced me to Rebecca. As I grappled with the convergences and divergences of the foursome’s lives, our ongoing dialogue helped me grasp the affinities in their aesthetic practice and imagine ways for readers to experience them by retelling the story through the choice and arrangement of the illustrations. Over the seven years it took to write the book, Lance gave abundantly of his time, complementary talents, and sense of humor. I believe that our collaboration would have amused the four could they have watched us reweaving the tapestry of their lives. These days, collaboration is something of a buzz-word and probably not the term that the Stieglitz circle would have used. Just the same, the very process of writing Foursome allowed me to see how group biography may suggest narrative patterns that portray each subject’s singularity while pointing up the serendipity of their encounters.